Pyongyang has declared the UN Security Council resolution to apply sanctions an “act of war” (AP). 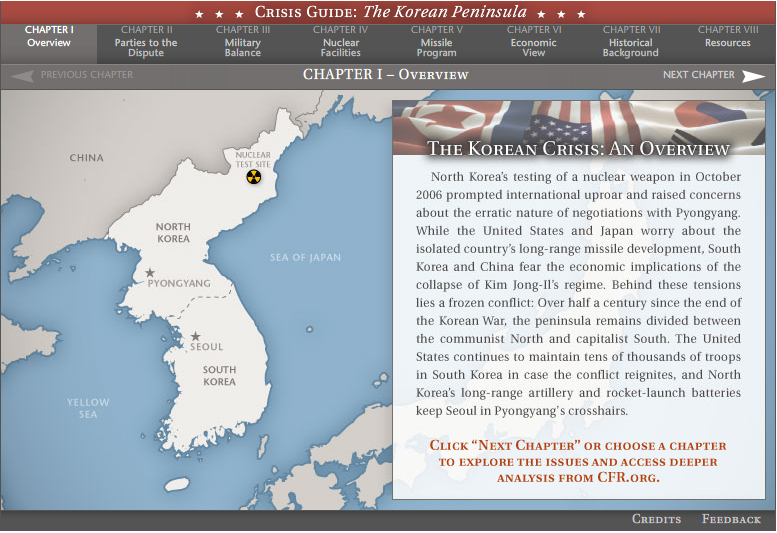 The statement issued by the foreign ministry of the Democratic People's Republic of Korea (DPRK) described the United States as “the ringleader that pushed us to a nuclear test.” CFR Vice-President Gary Samore, in an interview with CFR.org’s Bernard Gwertzman, says the North Korean test was “a purely political act” in reaction to the U.S. decision last year to sanction illegal North Korean banking activities in Macao. According to Samore, these activities were “directly related to the personal income of the leadership in North Korea.” Samore, who helped negotiate the 1994 Agreed Framework designed to control Pyongyang’s nuclear ambitions, praises UN Security resolution 1718 for targeting DPRK nuclear and missile programs. But he warns the sanctions are unlikely to break the back of the communist regime because they lack restrictions on Chinese and South Korean trade with the Hermit Kingdom. World leaders condemned a North Korean nuclear test threat (Reuters Video), which Pyongyang claims is necessary in the face of U.S. hostility. A government statement did not disclose a date for what would be Pyongyang’s first known nuclear test, but said North Korea was compelled to follow through (Yonhap) with the test because of the “U.S. extreme threat of a nuclear war and sanctions and pressure.” Christopher Hill, the top U.S. State Deparment official on Asia-Pacific relations, gave Pyongyang a stern warning: “We are not going to live with a nuclear North Korea, we are not going to accept it.” The White House said a test would threaten East Asian security and that the United States will work with the UN Security Council and Six-Party Talk members to oppose Pyongyang’s “provocative announcement.” In 2005, North Korea walked away from talks with the United States, Japan, China, Russia, and South Korea and has refused to return to the negotiating table because of U.S. financial restrictions, specifically a clampdown on Pyongyang’s alleged counterfeiting activities (NYT).